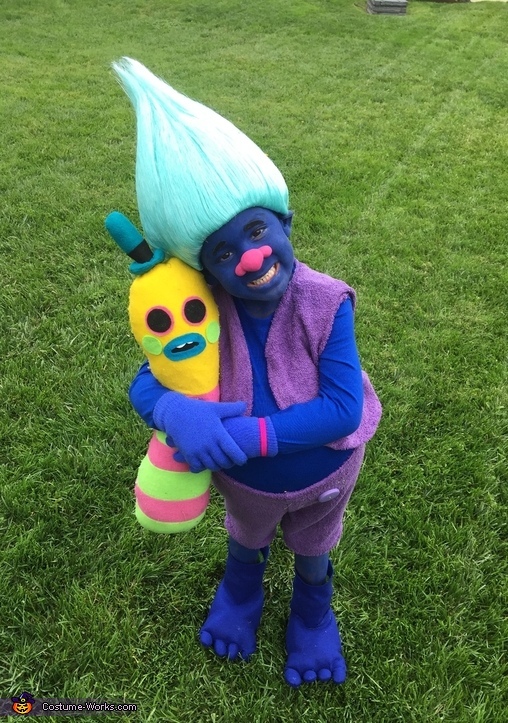 My Son Jacob is wearing the homemade costume to look like his favorite character from the Disney Movie Trolls. There is no costume out there for sale so Mommy decided she will fulfill Jacob'shopes in turning into Biggie for Halloween. Jacob can watch the movie Trolls over and over and in doing so I realized how fun and colorful the characters are. Biggie's costume consists of my old purple towels, felt, crayola air clay and Mehron paint. With my Simple sowing machine I put it all together so Jacob can have Biggie's outfit! I even made Biggie's pet Mr. Dinkles with nothing but felt. I had so much fun making this as my Son enjoyed getting into character!